One in five patients (21%) report that they are dissatisfied with their meniscus surgery results, and another two in five (41%) report that they are only partially satisfied. That’s a whopping three in five patients (62%) who are not fully satisfied after undergoing surgery for a torn meniscus. This doesn’t seem to echo surgeons’ claims of patient satisfaction, which estimate that over three in five patients (64%) are highly satisfied with their meniscus surgery results. Think about this! Three in five patients say they are dissatisfied or only partially satisfied with their meniscus surgery, while surgeons estimate the opposite, that three in five patients are highly satisfied. So who’s right? The patients who had the meniscus surgery or the surgeons? Since we are talking about patients’ satisfaction with their own surgeries here, clearly the patients are providing more accurate feedback. So are surgeons just missing the boat on their patients’ satisfaction, or are they selectively ignoring major leaks in the faulty ship named the U.S.S. Meniscectomy? In this article, we’re going to inspect the biggest leak—pain, the most common reason 62% of patients report they aren’t fully satisfied with their meniscectomy—and debunk the surgeons’ estimates, but first let’s review the meniscus and meniscus surgery (meniscectomy). The knee joint has cartilage that covers the end of the leg bones and cushions the joint. The meniscus is an added shock absorber that helps to protect the cartilage. (Watch the video at the end of this post if you want a more advanced look at this anatomy.) A tear in the meniscus seems like it would be a real problem, reducing the ability of the meniscus to guard against cartilage loss, and there is some truth in the assertion that a torn meniscus is less able to do its job. However, there’s one problem with operating on the meniscus—removing parts of it makes the wear-and-tear forces worse. Most surgeons would likely say a meniscectomy is a meniscus repair, but the Latin -ectomy actually means removal or excision, so the medical definition of meniscectomy is excision of the meniscus. And, indeed, the torn parts of the meniscus are typically excised, or debrided, in a meniscectomy. So to call it a “repair” is a bit misleading—what’s really being done more than 90% of the time is that the torn meniscus piece is removed. So while the torn meniscus may be less efficient in helping protect the cartilage, removing a piece of the meniscus makes matters even worse! Many prior studies have shown that meniscus surgery increases the loads on the cartilage, leading to more wear and tear, and it’s easy to see how chronic pain could be a consequence of this surgery. While there are many chronic issues, such as decreased range of motion, stiffness, and swelling, patients report following meniscus surgery, chronic pain is by far the biggest complaint patients have. Ironically, pain is typically what drives a patient to get the surgery in the first place. What’s the deal with the pain, and why isn’t knee surgery fixing it? Well, let’s go all the way back to the MRI that diagnosed the meniscus tear prior to surgery. If you have a meniscus tear show up on an MRI, it must be causing your knee pain, right? Wrong! Much research in recent years has shown that some patients with little to no MRI findings have a lot of pain and some patients with many or severe MRI findings have little, if any, pain. This study, for example, (by the same Framingham group that showed us that knee meniscus tears on MRI are found as often in middle aged or elderly people with pain as without pain) concluded the following: “The prevalence of at least one type of pathology (‘any abnormality’) was high in both painful (90–97%, depending on pain definition) and painless (86–88%) knees.” What this boils down to is that in many patients, meniscus tears can be a symptomless, pain-free normal part of aging (no more abnormal than graying hair), so it’s flawed, at best, to assume a tear is causing knee pain. 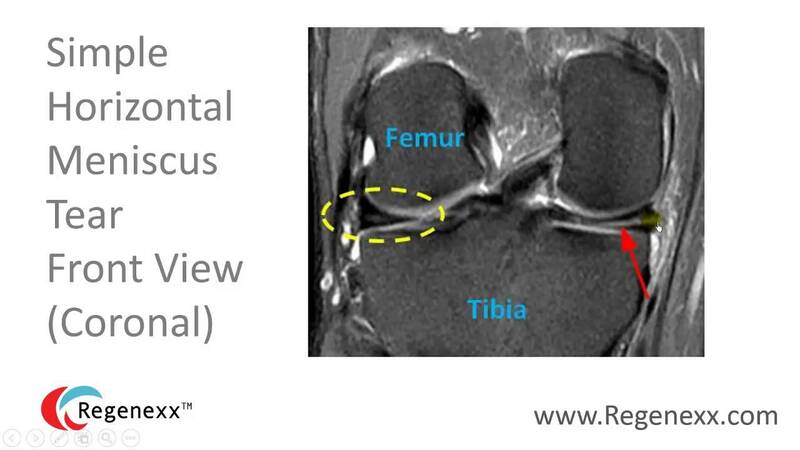 So why do physicians continue to assume that a meniscus tear seen on an MRI of the knee is the cause of the patient’s pain? Why do they continue to ignore this major leak in the ship and all the red flags pointing right at it? It’s mind-boggling! Pain is a complex phenomenon, and diagnosing why a body part hurts is rarely as simple as looking at an MRI image. This all fits with the Orthopedics 2.0 approach we use, where the cause of knee pain is as likely to be a pinched nerve in the back as it is to be the knee itself, which explains why a patient can have knee pain when an MRI of the knee shows nil. The most alarming part of this sinking ship is that a surgeon can perform an invasive meniscus surgery, cutting out torn pieces of your meniscus, in order to “fix” your knee pain, and your meniscus surgery results are likely to include chronic knee pain. The reason? It could actually be your back causing your knee pain, or something else altogether, and if this is the case, what was the point of the meniscus surgery? And with interventional orthopedic options available, such as stem cell therapy for knee meniscus tears, even if it is your knee causing your knee pain, there’s rarely a reason to climb aboard the U.S.S Meniscectomy. The upshot? If you’re considering a meniscus surgery, especially if your primary reason is to eliminate your knee pain, abandon ship! Pay close attention to actual patient satisfaction—that’s the true measure of whether a surgery is a success, not the surgeons’ estimates of patient satisfaction. what do stem cell injections cost? Is it one or multiple injections? How long does it last? Do I need one for my knee and one for my hip? I have osteoarthritis. Dear Chris, thank you again for explaining the difference between surgical pathology and patient reports of pain. They do not match very well. 10-15% of patients report pain after surgery, chronic pain, and that is not written in most surgical consents and yet it is the most prevalent complication of surgery. When myelinated nerves are traumatised there is a reduction of mylelin and shrinkage of nerve coverage exposing the axon and increased expression of pressure sensitive sodium channels. this converts some proprioceptors and mechanoreceptors to nociceptors(although it is really the axons which change and not the receptors!) so we see pain where non-pain was present before. Nerves are traumatised in hypermobile joints(well-reportred in Ehlers-Danloss) and converted to nociceptors. This in part explains the link between osteoarthritis and pain around joints in the absence of inflammatory mediators. It also partly explains the persistence of pain despite high quality joint replacement in 10-15% of replacements. Arthroscopy does not remedy hypermobility and would not be expected to remedy this pain generator. In your article, Chris, you actually summarise literature suggesting an increase in instability(hypermobility). The Regenexx procedure should decrease instability and reduce this component of pain generation. To a lesser extent this should or could be seen with PRP, Dr. Shallenberger's Prolozone and prolotherapy. Thank you so much for all you are doing! Your articles add so much clarity to my world of chronic pain medicine. My 16 year old has an outer meniscus tear. He is a track and basketball athlete. Is he good candidate? Establishing Candidacy is a specific process which many factors go into. That said, young and healthy with an injury generally makes someone a very good candidate. http://www.regenexx.com/the-regenexx-procedures/knee-surgery-alternative/ There is a Candidate Form on that page.